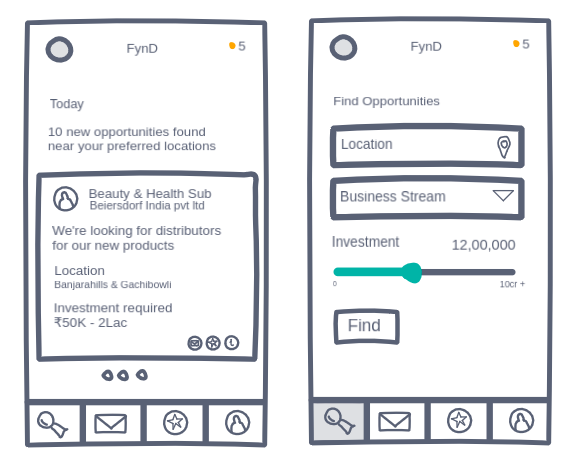 FynD is a unique and first of its kind networking platform connecting sales professionals and distributors/new aspirants through a digital platform. Sales Professionals and/or companies can reach out to the distributors based on geographical location, business streams, infrastructure, budget, etc., and find out their interest in new business opportunities. For decades, a large amount of time and money is being spent by companies in order to appoint the distributors to promote their products and services. Companies have been using various offline methods such as market surveys, referral programs, print advertisements, etc., to find out the right partners. All these manual interactions involve cost, time & a lot of efforts. However, there is no online platform to address this niche business problem. As the Product Designer for this project, I was responsible for end-to-end product design solution starting from validation to conducting user research, creating user stories, task flows, low-fidelity and high-fidelity prototypes. As we now know the problem, we wanted to quickly conduct market demand and trends research on the internet and gather useful information to validate the idea. We looked at the competitor landscape and how the target users are trying to find information from various locations using free tools like Google AdWords (what people are searching for), Google Search(content competition), Google Trends (Geographic Validation) etc., We recorded all the information in the form of Google Spreadsheets for future reference. How did you find your current opportunity? Are you interested in new business opportunities? Do you know how to find new opportunities? Do you know where to find new opportunities? And then, we spoke to a few regional sales heads to find out their pain points and how they're currently reaching out to the distributors to promote their products and/or services. How did you find your current distributors? Where do you find new aspirants/deals? How do you validate if she/he is the right fit for your business? What do you expect from them to be a partner with you? It took nearly two weeks to analyze the data we collected and to refine the initial idea further. We were good to go! Now the time for defining the "problem statement" in few words to help all the stakeholders to understand the key user value and the product market fit. "FynD is a unique and first of its kind networking platform connecting sales professionals and distributors/new aspirants through a digital platform." Aditya is a Regional Head - Sales & Marketing at x-LED Company. Aditya's company is introducing a new product line in the 4th Quarter of this year. As a regional head for South India, his responsibility is to appoint new distributors to promote their new products. He is looking for experienced distributors for some selected locations. He is ok to talk to new aspirants if he cannot find experienced partners for a some selected location. He has only 6 weeks to find new distributors. He travels a lot across all the south Indian states and uses his smartphone for all the communication. Mahaboob is a distributor with over 10 years of experience. Mahaboob is having 10+ years of experience in distribution and dealership business. He has been promoting various products of multinational companies. Now he is looking for expanding his business into more business streams. He is specifically looking for electrical products as he already has some experience and past clients. He is looking to invest up to 2 crores in this new area. Mahaboob wants to utilize all the extra infrastructure he has such as a 50,000 sqft godown, 4 vehicles, and workers. Vijay Kumar is a new aspirant looking for new business opportunities. He wants to leave his job and aspiring to start his own company. He is really not sure how to reach out to the companies and find the opportunities. He is having 10 lakhs savings in hand and planning to go for another 10 lakhs personal loan to fulfill his dream. He is also looking for a mentor who could guide him through the new venture setup process. He wants to start his business in his hometown Khammam. After defining the user persona's, I was able to come up with some user stories and user flows to proceed with the further design process. For any project, user stories are critical which visualize the final vision of the product. 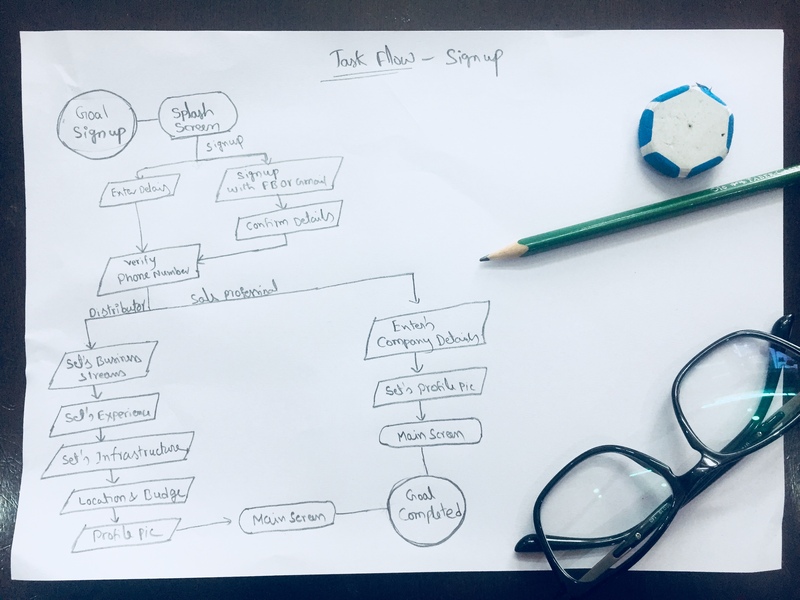 User stories help us to create task flows, and the task flows make wireframing easy. After creating some rough paper sketches, I used Invisionapp freehand drawing tool to create wireframes. In my experience, I found digital wireframes work better when you hand over the work to visual designers. I created task flows and wireframes for sign up, sign in, find opportunities, post opportunities, contact distributor/salesperson etc,. We received very positive feedback when we tested the wireframes with few known distributors and sales heads. We found some of the points they raised are the key essentials and excited to continue reworking on a few design changes. I will be back with an update to let you know how things pan out!